PGC-1a is critical to proper mitochondrial function. If you’ve got mitochondrial problems, this post is a must. If you want to interpret your genes, you should use SelfDecode. Do You Have Low PGC-1a? Do you get tired often? Do you have a low metabolism? Do you lack energy in the day? Do you have a disturbed circadian rhythm? PGC-1a is one of the most important factors in controlling mitochondrial health. It’s also important for circadian rhythms, energy metabolism, fat metabolism, weight loss, blood pressure, cholesterol homeostasis and indirectly can help detoxing and drug metabolism. PGC-1a protects against neurodegenerative diseases, decreases inflammation (R) and insulin resistance. 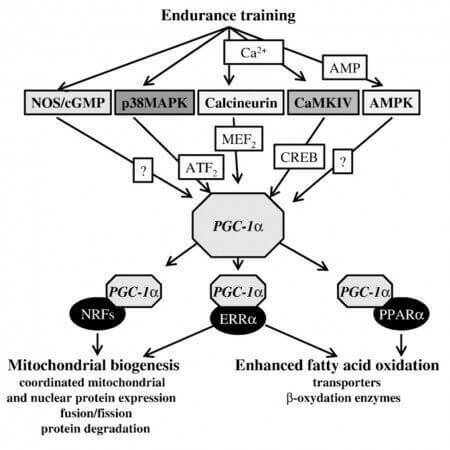 PGC-1a is one of the most important factors in controlling mitochondrial health. PGC-1α makes new mitochondria and improves its function. PGC-1α increases energy metabolism and weight loss. This protein may be also involved in controlling blood pressure, regulating cellular cholesterol homeostasis, and the development of obesity. PGC-1a protects against neurodegenerative diseases. PGC-1α decreases inflammation (R) and insulin resistance. 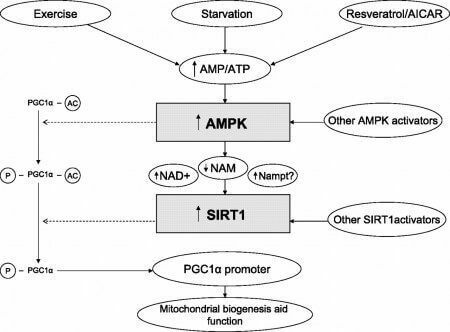 PGC-1a increases fatty acid burning by increasing the carnitine genes (CPT1A (R)). PGC-1a increases Nrf2 (R), which is important for detoxing. PGC-1a increases PXR (R), which plays an integral role in drug/toxin metabolism by regulating the expression of drug metabolizing enzymes and transporters. PGC-1 alpha stimulates the expression of clock genes, notably Bmal1 and Rev-erb alpha (R). Mice lacking PGC-1 alpha show abnormal circadian rhythms, body temperature, and metabolic rate (R). Increasing PGC-1a helps mitigate symptoms of genetic muscle disorders in animal models (R). I’ve already discussed some common pathways to activate PGC-1a. This means that if you activate these, it will help activate PGC-1a. SelfDecode is the best gene analyzer around and helps you interpret your genetics from 23andme and ancestry. Do you have studies regarding PQQ, its affect on apoptosis or cancer cell growth? If cellular mitochondrial growth is accelerated how would cancer cell growth be affected? Do cancers have mitochondria? I would appreciate any medical studies you may have on PQQ and impact on cancer cell growth. I am encouraged by your studies ! Joe, have you heard of a product called ASEA? It’s marketed as a redox signaling supplement to improve mitochondrial function and promote cell resilience. I think it’s kind of like engineered salt water.